The way you set up these packing pieces will depend on the material you use to make them. 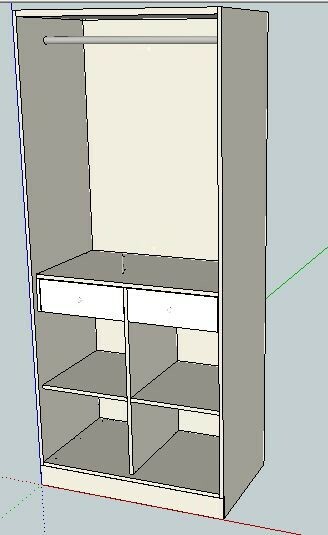 To start, I would isolate the drawer side volume with shelves or nil panels and in this volume insert either an upright or a horizontal panel. This panel could have an assembled structure applied to it if the packing is in solid wood. If this situation occurs frequently it would probably be best to create a specific shelf type that would come in as a specific material with the required thickness and a structure. 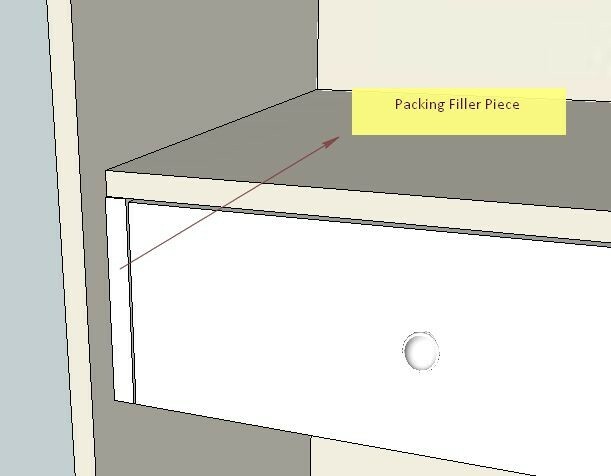 We create wardrobe with packing pieces as shown in the attached image, so that drawer channel doesn’t hit the hinges . Can we create these packing pieces by adding a Free Vertical Division and then an upright in the space , is there a better way of doing it ?